Angelina Morgan is a beautiful consultant who practices an ancient art form called Feng Shui. Will Scott is an all-business CEO who doesn't believe anything he can't see and touch. With the help of a meddling ex-wife, a well-meaning best friend, and a matchmaking mother, Angelina and Will are about to find out what happens when opposites attract...and sparks fly.Don’t miss Lucy Kevin’s other bestselling romances…"Four Weddings and a Fiasco" Series Book 1: The Wedding GiftBook 2: The Wedding DanceBook 3: The Wedding SongBook 4: The Wedding DressBook 5: The Wedding Kiss"Walker Island Romance" Series Book 1: Be My LoveBook 2: No Other LoveBook 3: When It's LoveBook 4: All For LoveBook 5: Forever In Love"Married in Malibu" SeriesBook 1: The Beach WeddingBook 2: The Summer WeddingBook 3: The Barefoot WeddingBook 4: The Moonlight WeddingStandalone Romances:Falling FastSparks FlyWHAT READERS ARE SAYING ABOUT LUCY'S BOOKS...“After a long, stressful week at work, reading Ms. Kevin's novel was a refreshing, relaxing way to wind down on a summer afternoon.” 5 star review for Falling Fast“I loved this book!” 5 star review for Sparks Fly“Beautiful and sweet heartwarming love story. I LOVED it! If you prefer to read contemporary romance books without the sensual scenes, this would be a great book to read! I highly recommend this book!” 5 star review for Be My LoveABOUT THE AUTHOR:Bella Andre's New York Times and USA Today bestselling novels have been #1 bestsellers around the world and she has sold more than 8 million books so far! Known for "sensual, empowered stories enveloped in heady romance" (Publishers Weekly), her books have been Cosmopolitan Magazine "Red Hot Reads" twice and have been translated into ten languages. 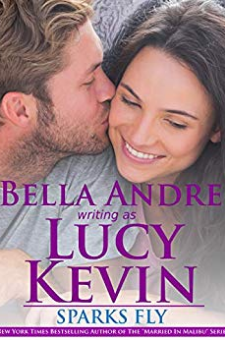 She also writes "sweet" contemporary romances as Lucy Kevin. There are more than 50,000 5 star reviews for Bella Andre's books on Goodreads!